Attractive Karndean flooring throughout the ground floor with carpets in all bedrooms. Gas fired central heating and hot water. Wireless broadband internet available. Strictly no smokers. One well behaved pet permitted (two small dogs may be allowed with the owner's agreement). * N.B. The sofa-bed is available for an additional one-two guests at a cost of 200.00 per week. around 4 miles west as the seagull flies, around 5 miles by road. around 4 miles west-northwest as the seagull flies, around 7 miles by road. 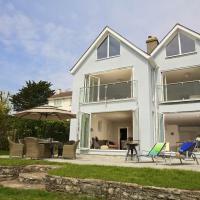 Sundowners - A holiday cottage in Devon, England. Book your next beach holiday through British Beaches.